As the weeks passed, Miff and the mouse established an uneasy relationship. When the mouse was hiding under the chest or in the walls, Miff would sniff close by and quiver her tail in agitation. When the mouse was actually in full view, and helping itself from her bowl, Miff would run into another room and hide. The mouse had a regular circuit - coming out from the wall by the fireplace, running behind the sofa, trotting through the hall and turning right into the study where it would vanish back into the wall via the cupboard, then re-emerge and scuttle into the sitting room again, zip behind the TV, help itself to food from the cat bowl and then feast on its ill-gotten gains under the chest. I bought a dozen small 99p mouse traps, baited them daily with a variety of substances - tiny chunks of Snickers bar, ham, cheddar, peanut butter, cat biscuits, (sometimes all at once), and placed them in all the places where the mouse would run, so it had to negotiate an obstacle course of delightful morsels whenever it set off on its travels. I left the traps unset for the first two days, (as per advice that you want the mouse to get used to them and decide that they are safe before you strike). Meanwhile, Miff was put on short rations, so that there were no scraps left for the mouse to steal, and the kitchen was kept squeaky-clean with all food in sealed plastic containers. The mouse ignored the new food supply and avoided the unset traps, leaping nimbly over the ones behind the sofa and tiptoeing round the one placed in the entrance to its hole in the wall. I set the traps and re-baited them. The next day, the peanut butter and chocolate was gone, two of the traps sprung - but the mouse could still be heard in the walls. Probably laughing at me. Was this some kind of bionic supermouse? Its brain was small but it was displaying levels of cunning that indicated a worrying evolutionary advantage over poor fat Miff, snoring away on the bed. The mouse was getting fatter, but it had not yet reached the size of a squirrel. Surely, though it was only a matter of time? Late at night, the drama reached its conclusion. Miff had come in from her evening promenade of the garden and was eating her dinner. The mouse was watching her from behind the TV. Emboldened, he began to inch forwards. I watched from the sofa, appalled. Surely Miff wasn't going to let him share her food, or worse still, retreat in defeat? I took off my slipper and threw it at the mouse in a rage. Miff looked surprised as the slipper landed behind the TV, but carried on eating. There was a vicious-sounding twang and a thwack from amongst the tangle of wires. I went to investigate. My slipper had startled the mouse, who had jumped out of the way - straight onto the baited Super-Size Rodent Instant Death Trap. The chocolate bait had been hurled into the air and a disgusting smell of mouse gore and poo was emanating from behind the TV. The mouse had been undone. I removed his furry corpse, still attached to the trap, showed it to Miff, who expressed no interest, wrapped the dead mouse in newspaper and several plastic bags and put it outside in the dustbin. When I came back in, Miff was finishing off the chocolate bait and cleaning her paws. I hope we don't have any more mice invasions, I don't think my nerves can stand it. Next time I catch a rat in the traps in the duck house I will see if my stomach is strong enough to take a photo as a comparison. They are huge and I am terrified of them. A mouse is just cat fodder - but not for your Mimi, obviously! Rats are grim. I shot one once and it exploded. I used to get paid to shoot squirrels; after hundreds of trees were replanted to replace the ones knocked over by the Great Autumn Storm of 1987 we used to get five pounds a tail. They were destroying all the saplings. I don't know why people get sentimental over squirrels, they are rats with fluffy tails as far as I am concerned. The pic isn't my mouse, as a) I couldn't find my camera at the time and b) my mouse ended up looking considerably more messy after the trap got him. Without going into details. Aw, I love squirrels. The one's in the cemetery near me rule. And that mouse was a legend. I salute him. Scottish author A.L. Kennedy said in a story of hers that squirrels are "rats with a perm". while I might not share her (and your) dislike for the aforementioned rodents, I nevertheless find this definition nothing short of brilliant. Thank you for the great update. I wish you no further mice, but, at least, you have a winning strategy if there is a next time. Oh you meanie ... but I understand completely. I'm going to have to post about my mouse adventure from a few years back. PS They do stink don't they? 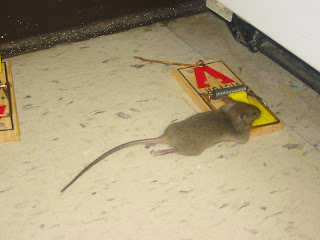 years ago in my first apartment ( oops,flat) i had a mouse problem. turns out that i had a hole in one wall which had to be sealed up. but cleaning very thoroughly,putting all food in sealed containers along with the same traps that you used did the trick. alas i thought that miff being the natural enemy of the cat-would do her duty..oh well. 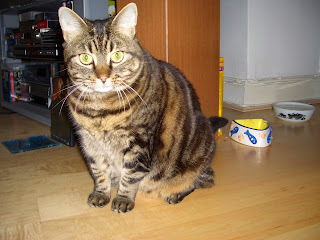 Miff looks remarkably like my beloved but now departed Pud'n. Sigh. Hooray!! End of that saga hopefully. Miff seems to have lost a bit of weight if that's a recent photo. Anyway, if any other mice decide to invade, I'm sure Cookie will be willing to lend a paw. Miff, pull you socks up! Looks like a girl mouse to me... hopefully she's not got baby meeses scurrying about. They do have no-touch-no-see mouse traps now. It would save you the gore if your saga has a sequel... Baby Mice, avenging Mamma. We had mice in our garage and when they disappeared we kinda wondered if our poison bait had worked. Then a few weeks later, Hubby saw a black racer snake, roosting contentedly in his tool box. He of course freaked, I was glad she was there. Snakes dont cause structural damage like Mice do.